Hermetic connectors provide an airtight seal and maintain a very high degree of electrical performance under the most extreme conditions. 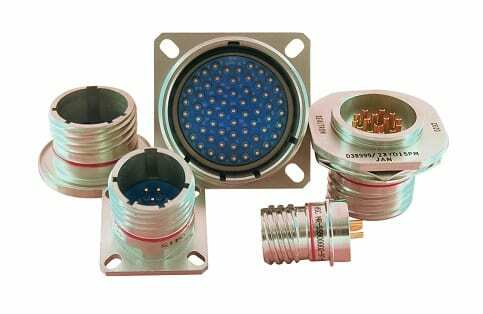 These connectors have low air leakage (hermeticity), high insulation resistance and high dielectric withstanding voltage. Hermetic connectors are therefore used where superior levels of corrosion resistance, insert retention and resistance to thermal shock is required. AMETEK Interconnect Technologies manufactures the most extensive range of hermetic circular connectors available. NYK Component Solutions has the exclusive European franchise and is, therefore, able to provide fully scheduled stocking and ad hoc small batch quantity supply across the complete product range. Series 9700 – This series of hermetically sealed connectors are manufactured in accordance with MIL-DTL-38999 Series I and the dimensional requirements of MS27469, MS27470 and MS27471. Electrical continuity is maintained between mating shells prior to pin and socket engagement, and in reverse order during the disconnecting process, thereby providing protection against EMI. The long shell design provides “scoop proof” protection for the pins during the mating process. The connectors are available in both tin plated mild steel and 300 series stainless steel bodies. Series 9800 - Manufactured in accordance with MIL-DTL-38999 Series II and the dimensional requirements of MS27475, MS27476, MS27477 and MS27478. This series is designed to provide low silhouette for minimum size and weight. They are available in both tin plated mild steel and 300 series stainless steel bodies. Series 9900 – The 9900 Series of glass-to-metal-sealed connectors are manufactured in accordance with MIL-DTL-38999 Series III and the dimensional requirements of D38999/21, D38999/23, D38999/25 and D38999/27. These hermetic receptacles provide excellent service in areas of severe environments, such as high temperature, humidity, vibration, shock and where EMI/RFI shielding is required. The triple lead thread offers quick disconnect (360º) with a non-decoupling feature designed into the plug. The scoop proof design prevents accidental bending of the contacts and provides for the grounding of the plug and receptacle prior to the engagement of the pin and socket contacts. Series 6720 – This series of hermetic connectors are qualified to the ASD specification and meet the dimensional and functional requirements of EN2997Y1, EN2997Y0 and EN2997Y7, including operations at -65ºC to +200ºC. Series 6700 - Qualified to the ASD specification and fulfiling the dimensional and functional requirements of EN2997YE1, EN2997YE0 and EN2997YE7, including operations at -65ºC to +260ºC. Series 8100 – This commercial equivalent series meets or exceeds the requirements of MIL-DTL-26482 Rev C. The 8112 and 8115 shell styles are dimensionally equivalent to MS3113H and MS3114H respectively, but are supplied without the interfacial seal. MS3112 does not specifically provide for a hermetic class, however, Sealtron’s 8113 shell style has the same mounting and mating characteristics and can be used when a flange mount is desired. Series 8300 – This series meets or exceeds the requirements of the latest revision of MIL-DTL-26482 Series I. The 8312 and 8315 shell styles are dimensionally equivalent to MS3113H and MS3114H respectively and are supplied with the interfacial seal. MS3112 does not specifically provide for a hermetic class, however, Sealtron’s 8113 shell style has the same mounting and mating characteristics. It can also be used when a flange mount is desired. Series 6300 – This series meets or exceeds the requirements of MIL-DTL-26482 Series II and the dimensional requirements of the following MS numbers: MS3443, MS3440, MS3442 and MS3449. These hermetic connectors are supplied with tin-plated mild steel shells and gold plated contacts. For severe environments, Sealtron also manufactures these connectors in 300 series stainless steel bodies. To improve moisture resistance these receptacles are supplied with interfacial seals which have the “cork and bottle” design. The standard range of GTMS bulkheads is designed to function in the severe operating conditions commonly encountered in oil & gas exploration and have been exposed to a combination of pressures and temperatures in excess of 25,000 PSI at 400ºF (204ºC). Ametek is extremely proficient in customizing the design of high-pressure GTMS bulkheads to meet even higher pressures and temperatures, up to 35,000 PSI at 500ºF (260ºC). Ametek has the experience to design, manufacture and test a product to meet your specific needs. Please contact us today with your requirements. Precious metal plated surfaces on the housing to improve ground connection from the housing to next level assembly to reduce the impact of EMI conditions. Please contact NYK Component Solutions to discuss your requirements. Available in shells and insert arrangements compatible with several MIL standards or a customer-specific design.